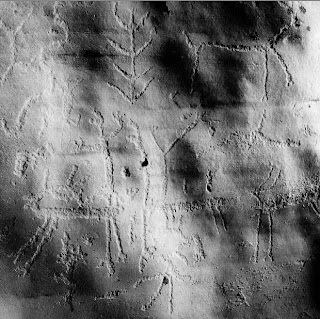 Take a good look, because this may be the oldest piece of art in the Americas. 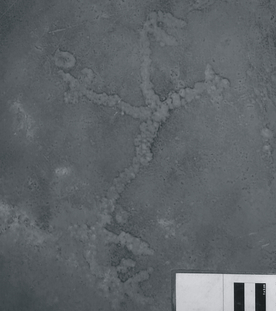 Archaeologists say it's also our earliest drawing of a human. Of course, when your Pictionary partner has been dead for been ten millennia, no one can tell you you're wrong. In eastern Brazil, the cave of Lapa do Santo is a deep toy box for anthropologists. It's a long, sloping space that sheltered groups of humans intermittently over 11,000 years of history. The ground is made of wood ash, from human hearths, packed as deep as 13 feet. It's full of graves. 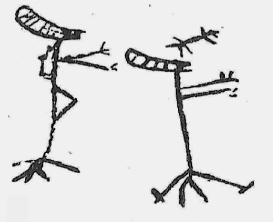 On one of the final days of their expedition, having dug to the very bottom of that ashy floor, a group of Brazilian researchers led by Walter Neves discovered the stickman you see above. He's about a foot tall, chipped out of the rock. I say "he" because that projection on the lower right is, according to the experts, a phallus. Radiocarbon dating of charcoal on the wall showed it to be more than 10,000 years old. And the carving was buried even farther down in the layers of ash than a hearth known to be about the same age. 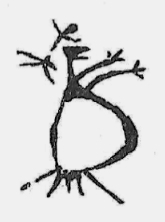 This means the figure can be "confidently" placed at 10,500 years old, Neves writes, and may be as ancient as 12,000 years. Personally, "human male" would not have been the first thing I thought when I saw this piece of cave art. 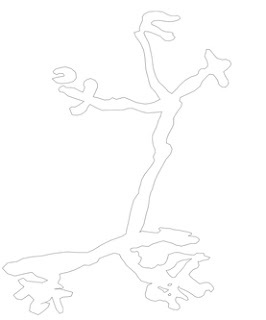 Why not a tree (with...exposed roots)? Some kind of flowering plant? A map of the cave's fire exits? Assuming it is a picture of a person, maybe it's a cave person's patent application: "After extending the arms and opening the mouth, step two is to squeeze your companion. I'm calling it a hug." Is that a pregnant cave woman with a baby flying out of her? Maybe this culture just hadn't invented any numbers bigger than 3, and therefore couldn't pin down how many limbs are on the average human. OK fine, now I see the phalluses. That's actually pretty disturbing. If you look closely, you can see some stick people along with stick deer in the cave wall above (and at least one stick plant). As sketchy as he is, the Lapa do Santo petroglyph has now claimed the title of the oldest known rock art in the Americas. 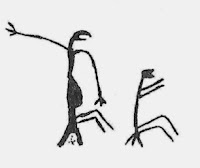 In 8000 BC, or maybe before, someone was determinedly chipping that stick figure and all of his extra limbs into a rock wall in Brazil. 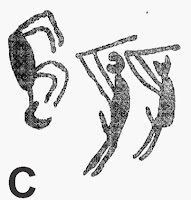 The similarity of cave art styles across different regions of Brazil suggests to researchers that these far-flung cultures were connected somehow. Caves a thousand miles apart show the same gape-mouthed, extra-manly drawings. This suggests, Neves writes, that Brazil was inhabited gradually rather than all at once. As human groups grew and traveled, they carried their symbolism with them. If you have more solutions to suggest for this prehistoric Pictionary game, please share them below. But be mindful of the cave children. 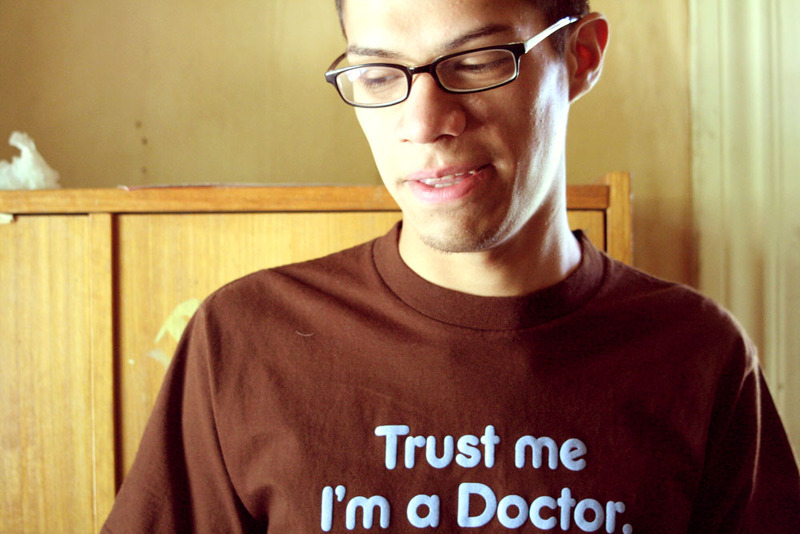 Images: First two from Neves et al. Others from A. Prous and G. Martin, found in figure S3 of Neves et al. Thanks for providing some context to this story. The news story I read on the discovery left the dating method and the basis for the interpretation of the graphic image very unclear. I'm not so sure about the importance of the graphic style being spread out over a very large area. The cultures of that time changed little over a period of centuries, and people used to traveling on their own feet could cover great distances in their lifetime. Your coverage on this topic is the best I saw up to now. Congratulations!